With high school athletics on a holiday hiatus, the Yampah Mountain junior varsity hockey team and the Glenwood Grizzlies’ hockey program became the two biggest attractions in the area, culminating in two thrilling wins at ‘The Cave’ at the Glenwood Springs Community Center around the holidays. Yampah Mountain opened up the regular season Dec. 22 with a matchup against the Battle Mountain junior varsity team and simply rolled to an 8-2 victory over the Huskies, scoring an impressive 6 goals in the first period to all but put the game out of reach. Against Battle Mountain, Yampah’s Coulter Strautman opened the scoring for the Grizzlies just two minutes and 50 seconds into the game, finding the back of the net at even strength off of an assist from Hunter Lohse. Kobe Ottosen stretched the Grizzly lead to 2-0 just under two minutes after on an unassisted goal before Strautman made it 3-0 on a power play off of an assist from Dylan Webster, igniting the rout. Holding a 3-0 lead, Yampah Mountain continued to pour it on offensively as Strautman found the back of the net two more times at even strength as Lohse, Webster and Traven Hammond assisted, giving the Grizzlies a 5-0 lead late in the first period. Anthony Guy sent the Grizzlies into the locker room at intermission with an even-strength goal off of an assist from Jacob Fowler, capping off a great first period of action for the Grizzlies. Coming out for the second period, Battle Mountain got on the board just 3:23 into the period as Alden Kotsick scored on the power play, but Yampah responded quickly with a short-handed goal from Fowler — off of an assist from Strautman — to put the Grizzlies back in front by six goals, 7-1. Midway through the period, Battle Mountain pulled to with five goals at 7-2 as Jensen Rawlings scored at the 8:52 mark, serving as the final tally of the period with Yampah Mountain holding a 7-2 advantage. 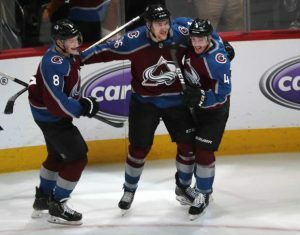 Ottosen capped off the scoring for the Grizzlies with a short-handed tally early in the third period, sending Yampah Mountain to an eventual 8-2 win on home ice. In net, Owen McConaughy stopped 15 of the 17 shots he faced before giving way to Daelen Renzi, who didn’t face a shot in 15 minutes of action. Aside from Yampah Mountain, the Glenwood Grizzlies’ A and AA teams hosted the Grizzlies’ annual Grizzly Holiday Festival, which turned out to be the Roaring Fork Challenge Cup. In the Roaring Fork Challenge Cup, Glenwood faced off with the Aspen Skiers at both the AA (Select 18U) and A (18U underclassmen) levels. In A action, Glenwood rolled to a dominant 6-0 win in the first game of the series as Ryan Kotz and Robbie Weir found the back of the net for the Grizzlies in the first period off of assists from Sean Mooney, Ian Holm and Traven Hammond. Connor Powell and Kotz made it 4-0 Glenwood in the second period off of assists from Anthony Guy and Kobe Ottosen before Nolan McPherson (assisted by Wyatt Boatright and Powell) and Cole Hawkinson capped off the scoring in the third period for the Grizzlies. In net, Daelen Renzi stopped all 15 shots he faced in the win. 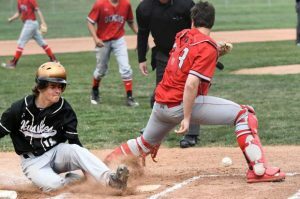 Following the impressive Game One win, Glenwood dropped a tough 8-1 decision in Game Two as a number of AA players for Aspen dropped down to the A level for the game. 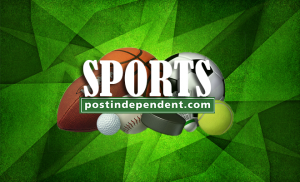 Ottosen scored the lone goal of the game for Glenwood on a power play goal at the 3:03 mark of the first period off of an assist from Kai Kanzer, tying the game at 1-1 before the Skiers pulled away. In net in Game Two, Renzi was peppered with shots, stopping 24 of 32 in the loss. Glenwood fared much better in AA action, tying Aspen 3-3 in Game One action as Brody Bittner, Devlin Powell and Billet Porter potted goals for the Grizzlies, while Porter and fellow captain Mathew Thrun dished out assists in the tie. Josh Cook stopped 25 of 28 shots in the tie game, setting up a thrilling second game of the series. In the second matchup between the two teams in the Challenge Cup, Glenwood picked up one of the biggest wins in program history, defeating Aspen at the 18U level for the first time ever in a 4-3 overtime win after Aspen tied the game at 3-3 with just 37 seconds left in the game on a penalty shot. Dylan Webster started the scoring in the second game for Glenwood with an even-strength goal off of an assist from Hyland Barabe at the 7:02 mark of the first period, before Erich Albrecht made it 2-0 Glenwood just over five minutes later on an even-strength goal off of an assist from Webster. Aspen bounced back in the second period to tie it up at 2-2 off of goals from Liam Rigney and Ethan Hunt, but the Grizzlies bounced back quickly in the third period thanks to Albrecht’s second goal of the game, this time off of an assist from Porter at even strength. Trailing 3-2, Aspen’s Dominic Lanese scored on a penalty shot to tie the game at 3-3 with just 37 seconds left, forcing overtime. In overtime, Porter scored one of the biggest goals of his carer just 1:06 into overtime, finding the back of the net at even strength off of an assist from Travis Leahy, giving Glenwood a thrilling win. In net, Cook stopped 31 of 34 shots to backstop the Grizzlies to the win.